Portsmouth Ladies captain Charley Wilson says her side "should not be afraid" of Sheffield FC on Sunday. 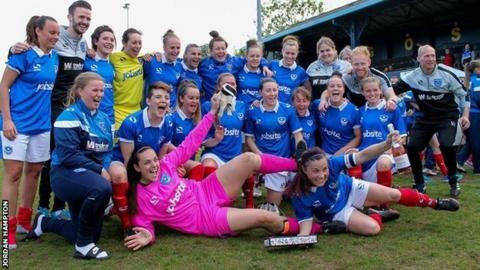 Women's Premier League Southern Division winners Pompey face the Northern Division winners Sheffield in a play-off to decide the WPL title. The winner will be promoted to Women's Super League Two, subject to a licence. "I think we can do it," Wilson told BBC Radio Solent. "It's a one off game and anything can happen. I think we've got the strength in the squad to do it. "Sheffield are a good team, they're a bit similar to us and quite a physical side." Portsmouth lost 2-0 to Sheffield when the teams met earlier in the season in the Women's Premier League Cup. "On that day we didn't play very well," Wilson added. "I think we were a bit afraid of them. This time around, we know what they're about, and we should not be afraid. "Maybe it's a good thing that they've played us because they might be a little overconfident." First team manager Perry Northeast added: "Both teams will go in there flying with confidence. We'll have a plan and want to execute it properly. "Sheffield are a really good side. They are a bit like us. When we played them (earlier in the season) I felt we didn't turn up. "If we just up our game by five or 10 %, who knows what can happen." Sunday's play-off game kicks off at 14:00 BST at the chosen neutral venue, Stratford Town FC.